This site is not becoming a full blown low-carb/diabetic site, I swear. But this subject is at the top of my mind at the moment, since I'm still figuring out how to eat with these restrictions for myself. So please bear with me for a few such posts. As I wrote about previously, one challenge that I am facing as a Japanese-food-centric low-carb eater is to find bland, 'carrier' food type things to replace the mound of plain rice that I have been accustomed to having with my meals. In Japanese low-carb circles, the most popular bland rice replacement food is plain tofu. In Japan, I might go along with that, but here I really can't. For one thing, even the cheapest Japanese tofu is much better tasting than the tofu I can get here. I have no problems eating Japanese tofu straight up without any adornment, but the tofu here - not really. I could make my own tofu of course, but that is a lot of work, and not something I really want to tackle in my kitchenless state. Add to that the fact that halfway decent tofu here is quite expensive. So, I needed to come up with a way to make plain tofu tasty enough to eat regularly, and this is what I have come up with. It's basically a low-key, low-seasoned version of a classic Japanese dish, iri dofu. While regular iri dofu has lots of seasonings and salt in it, since it's meant to be eaten with plain rice, I've really dialed down the seasonings for my bland-foil version here. It has no salt in it, just the umami that comes from salt-free dashi or stock. I usually add bits of vegetables to liven it up too - here I've added some peeled and finely cut broccoli stalk that was lying around in the fridge. It does form a fine foil for other foods. Note that since tofu is mainly protein, you'll want to go easy on protein-rich accompaniments. One of my favorite things to eat with this is some stir fried vegetables, using whatever I have on hand, with lots of onions and garlic added. Take the tofu out of its container or bag and drain off all the water. Put the tofu on a plate, and place another plate on top, with a weight of some kind (like a can of tomatoes or something) on top of that plate. Leave until the tofu has lost about 1/3rd of its height, draining off the water that comes out periodically. Crumble up the tofu with your hands. Put a large frying pan or wok, preferably with a non-stick coating, over high heat and add the stock. Add the tofu and vegetables, and stir around until the moisture has evaporated. Serve hot or cold, as a rice replacement. 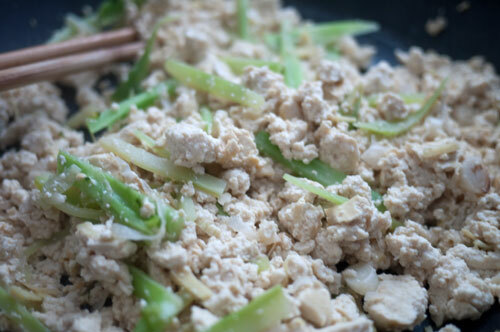 To turn this into "fried tofu" that sort of resembles fried rice, stir fry some chopped up green onions and ginger in some oil (add a drop of sesame oil), and add the cooked scrambled tofu. Finish off by seasoning with soy sauce, salt and pepper to your taste. You could add some chopped up ham o bacon too. For you soy/tofu scaredy-cats out there, I eat this maybe 2 or 3 times a week. I can't afford to eat more than that really, and I like variety! I'll have some more low-carb rice replacement recipes in upcoming posts. Submitted by maki on 2010-09-09 11:01. I have been making something called Tofu to Moyashi no Chingensai Itame from a cookbook by Harumi Kurihara. It calls for frying up the crumbled tofu in sesame oil, put it aside, stir fry veggies, add back the tofu and season with chinese chicken/pork stock granules (sodium and msg!) and sesame. Very delicious, I can eat this twice a week. The tofu absorbs the sesame flavor and I put loads of veggies into it, red pepper, sprouts, bok choy etc. I do eat it with rice, but it is the star of the meal. I will try it with the dashi for less fat. I guess we are very fortunate in Portland, Oregon to have local tofu makers here (and Seattle and Vancouver) thanks to our Asian population on the West Coast. Probably not as good as J tofu, but it is delicious to me. Tofu-phobes don't know what they are missing. 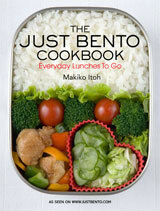 I enjoy your posts very much and look forward to your Bento book. Just wanted to express 1) my excitement at the idea that you may be posting some more Japanese-cuisine-influenced low-carb recipes and 2) my hope that your recovery is going well. I second this! Low sugar/carb recipes from Maki make my day! It's perfectly understandable that you have been posting more low-carb recipes at the moment, and it's actually very interesting! It's never easy to make changes to one's diet, and so I hope the recipes you have been exploring can help others who need to reassess their carb intake, as well as inspiring me to look for different ways of eating. Glad you seem to be recovering well. Just feel bad for you not having a kitchen! I appreciate your new attention to lower carb eating. My South American husband has been struggling to reduce his rice intake to deal with full blown diabetes. He says "I never feel like I ate". He is actually struggling to keep weight on his body. I have found a lot of inspiration on both of your blogs. Even with the higher carb versions of recipes for Bentos are useful. I have been trying to make our food more beautiful which seems to help. I have had a real battle to keep my weight on, being insulin deficient, but have been able to successfully GAIN weight on a very low-carb diet by increasing my protein(from meat) portions. That's what Dr. Bernstein recommends for his thin patients. It can take some experimentation to find the right amount that works for a person. Sufficient protein and fat may help keep him satisfied. Good luck! Huh. Looks like gray scrambled eggs. I wonder how it would taste in a burrito? Or I guess actually, you'd wrap it in some sort of asian wrapper. Maybe I'll try it. I like tofu. If you are going to wrap them in a burrito, you'll need to add seasoning - these by themselves will be very bland. Thanks for the low-GI/GL recipes, Maki, they're great. I've been trying to eat a low-GI/GL diet for a few years. You're absolutely right that you need to find alternative 'bland foils' to the rest of your food. It took a while, but I now find that I'm used to not having these at all with some meals, I think it's partly a matter of habit. I've found that a not-too-salty miso soup is a good gentle foil to more flavoursome foods. Yes, it's a shame that tofu is so often bad quality and expensive. No wonder so many people think it's horrible! I live in the UK, and the only one I've found that is good enough to eat plain is Taifun silken tofu. It's pricey and hard to get hold of, unfortunately. I'd like to make my own, but realistically I know I won't find the time often. I shouldn't complain though, it's so much easier to get Japanese products than it was a few years ago. My father is diabetic and has replaced most of the potatoes in his diet with cauliflower. We steam it and mash it. We boil it and pan fry it like home-fries. We also roast it and squish it up with a fork. Then it looks like rice! It just has a neural "veggy" flavor. Also vinegar has an affect on carb digestion. If I make sushi rice (with a artificial sweeten) my blood sugar is less affected. With no local sources for fresh tofu in my corner of Delaware, I made my own tofu out of local soy beans. The result was excellent but the process, soak, boil water, puree, strain, squeeze, boil soy milk,etc took over my entire kitchen, and lots of clean up. Then I got one of those counter top soy milk makers. It produces about half a gallon of soy milk at one time, and it's already heated up once it comes out. From there I add the nigiri and dip out the curds. The result is a smaller batch of tofu but I make it more often. It's not the most heart healthy of foods, but it sounds like you could get away with eggs Benedict on tofu. If you drain the tofu really well and then bake it with some olive oil and cider vinegar, and then top it with some bacon or ham, a poached egg, and a dollop of hollandaise sauce, you've got a pretty nice low-carb breakfast. It's not something I'd want to be eating every day, but it's a nice occasional treat. Although, admittedly, I'm not a low carb watcher -- I just like tofu. Anyway, I really like the site. Thanks for all the great cooking info.